Franny had her gluten-free cake and she ate it too. Thanks Goodbye Gluten! 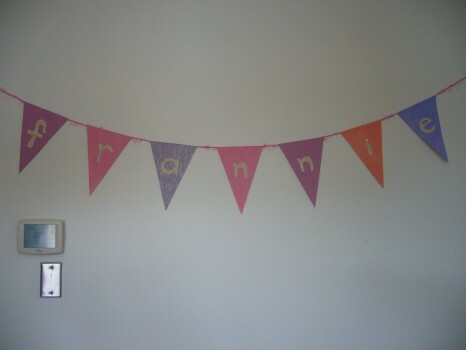 Franny turned 5 a few days ago. Unlike her big sister, she does not have celiac disease. Though she doesn’t eat gluten at home because our house is a gluten-free zone, she sometimes eats food with gluten when she goes to friends’ houses, when we visit family members and when we eat out. She and I used to have “gluten Tuesdays”—after her music class we would go a bakery and she would get to indulge in a fresh, soft bagel or yummy muffin or flaky croissant. Franny understands that Lily cannot eat gluten but that she can. Oftentimes when she eats something really delicious she’ll look at me and ask: “Mommy, is this gluten?” And it usually is. When the kids were quite little I was really getting into baking. Both of my grandmothers were incredible bakers and some of my most cherished memories of them involved baking—whether I was licking the bowl after helping my Nana Lil make her famous mandelbread (I dream of that batter!) or sprinkling chocolate chips into my Bubby Fran’s beloved banana cake. I yearned to create memories like that with my children. But then Lily got diagnosed with celiac disease and my kitchen was turned upside down. There was a big learning curve. Shopping now took me hours: scrutinizing every label and constantly referring to my bible—the pocket-sized Guide to Acceptability of Foods and Food Ingredients for the Gluten-Free Diet (written by registered dietitian Alexandra Anca, who will be on-hand at the Gluten Free Garage!). I had to adapt to cooking gluten free, so baking fell by the wayside. And then I started to miss it. So I began to learn about gluten-free flours and what and how much to substitute. There were words like xantham gum and guar gum. I got a scale because one of my favourite gluten-free bloggers, the Gluten Free Girl, says it’s best to bake by weight. Baking soda: GF or not? I found it all so daunting that I started to dabble in mixes. And some were OK but I wanted to bake like my grandmothers, from scratch. I bought a whack of gluten-free cookbooks and found some great gluten-free recipes online and now I have a few home-baked staples that we all love. But at some point, I kind of gave up on my desire to be the mom who bakes birthday cakes from scratch. This was around the same time the kids started going to friends’ birthday parties with cakes adorned with princesses and other Disney characters. They wanted Ariel on their cake! My Little Pony! Luckily my mother-in-law gives the Cake Boss a run for his money, but I couldn’t push my luck. She bakes the cakes for family birthday celebrations; I wasn’t about to ask her to whip them up for kid parties too. So for three years I did what any mother afraid of gluten-free baking would do: I convinced Franny that she wanted an ice-cream cake in October and I told Lily that cupcakes were way better than cake. 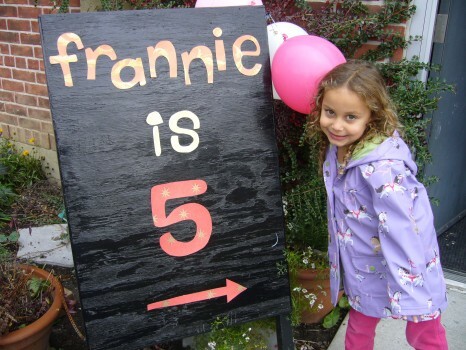 Until Franny turned 5 and asked for a Barbie cake. After wrapping my head around the thought that she’s only 5 and already into Barbie, I thought, why not? I played with Barbie dolls and I turned out OK (my husband might say this is up for debate). I decided to go to Loblaws and get a Barbie cake for Franny and buy Lily a gluten-free cupcake. But then I felt bad for Lily. She’s always the kid at every birthday party who can’t eat the cake the other kids are scarfing down. Why would I exclude her at her own sister’s celebration? And herein lies the modern-day celiac mama’s dilemma: Where to get a gluten-free cake with Barbie on it? On a hunch, I called up Goodbye Gluten, our go-to store for one-stop 100% gluten-free shopping. They make delicious baked goods (all free of gluten, nuts and dairy) and their store is super kid-friendly. Whenever we go there, Lily has a field day because she knows that she can have it all. Most importantly, I can trust that there is no risk of cross-contamination when I buy their baked goods and prepared foods. Surely, Goodbye Gluten can make a gluten-free Barbie cake! And they did. 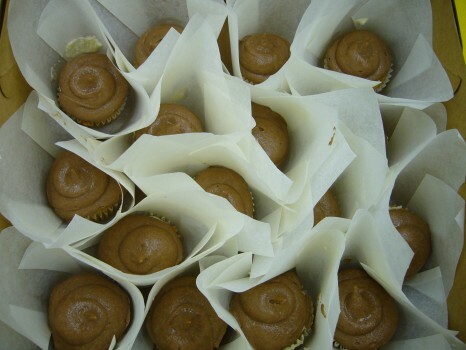 Because that’s what they do: cater to the gluten-free community and to those with food allergies. 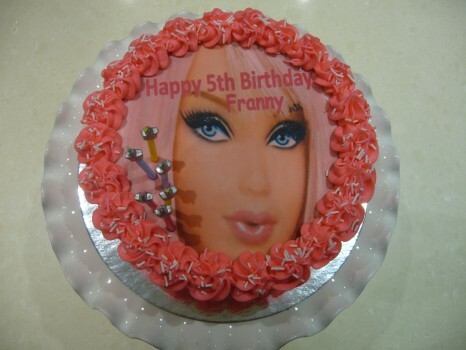 Franny got to choose the flavour of her cake (vanilla), the colour of the icing and even the hair colour of her Barbie. 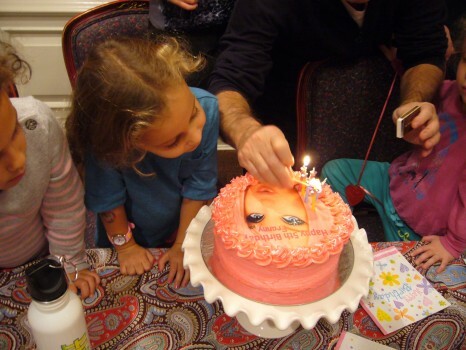 When we brought it to the table, she was blown away by the sight of her pinkalicious Barbie cake. As she gobbled up the first bites, she turned to me and asked: “Mommy, is this gluten?” She ate her Barbie birthday cake…and Lily got to eat it, too! Her wish already came true! 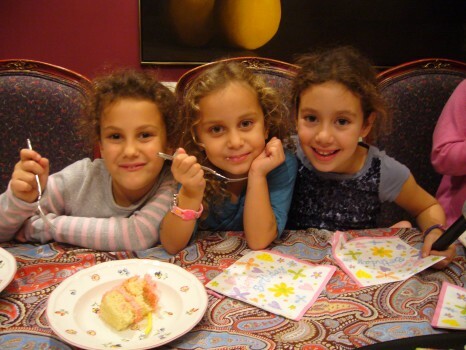 Franny celebrates with Lily and her big cousin Ella. 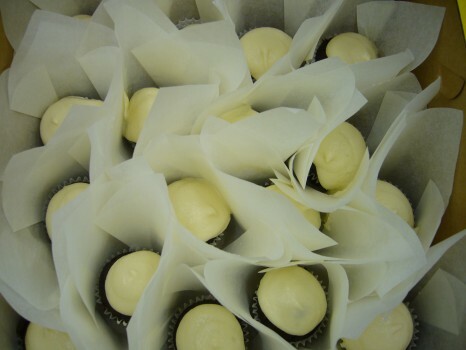 Stay tuned for more GF birthday goodies…we’re milking this birthday! Posted in Bakeries we ❤, GFG sponsor!, Happiness is..., Products we ❤, Stores we ❤, Tummy love.